John and I first met and worked together, for a number of years, on Open University residential schools. In the good old days, students taking a first year science foundation course (the module now known as S104) would be expected to spend a week away using the facilities at a conventional university, during the long summer vacation. There, they would get a taste of the practical skills associated with a range of different scientific disciplines, both lab and field-based as well, perhaps, as of the social side of regular student life. Students often came to residential school somewhat nervous and reluctant but nearly all left at the end of a week with much enhanced confidence and some new friends, as well as a grounding in practical science. Around 15 years ago, the OU decided that having an embedded residential component was discouraging some students from taking the core first level science module so decided to separate the residential school out and make it credit-bearing in its own right. Unfortunately this attempt to encourage attendance backfired badly, partly because of the extra cost students incurred. As student numbers dropped, economies of scale became smaller and some of the host universities found more lucrative summer guests until, in 2012, the last ever SXR103 residential school was held in Brighton. I have a huge amount of respect for students who obtain their degree from the Open University – it requires serious commitment to study part time, motivating yourself, whilst juggling family and work commitments. I would employ someone with this determination and these skills any time over a new graduate straight from the educational treadmill. However, although OU learning materials are excellent, the one thing you miss when studying at a distance is the chance to put your knowledge into practice. For me, opportunities of the type offered by residential schools are crucial for any graduate wanting to call themselves a scientist. OU materials include interactive graphics and ‘virtual’ field trips but, for the field scientist, there is no substitute for looking at real specimens in situ, be they rocks or plants. Natural variation means that not all granites will look just like the sample in your rock kit or the rotatable 3D photo online. Nor will the plant which has still to flower or just set seed be easily identified from the single picture in your key. As long-standing tutors of field geology and ecology respectively, John and I felt that students would miss out on starting to develop the skills they would need to call themselves practical geologists or ecologists. Our first weekend in Alnwick in 2013 was an attempt to redress the balance a little, taking a group of S104 students based in our own regions of Scotland and North-east England. The students thoroughly enjoyed the experience and, with the blessing of the S104 course team, we have been able to advertise the course more widely in subsequent years. This year’s students were even more enthusiastic than normal in their feedback. 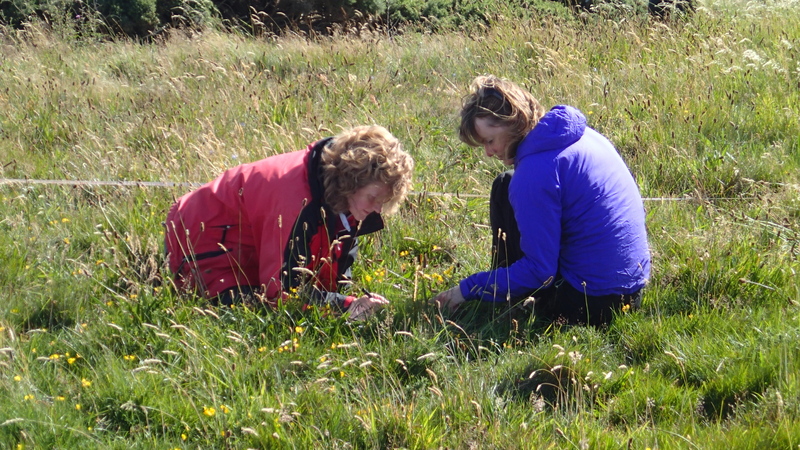 They gelled particularly quickly as a group and not only learned a lot about how to start looking at rocks and vegetation but commented that they had enjoyed both the social aspects (evenings in the pub) and the group work involved in surveying plants and lichens. One said she regarded the weekend as a ‘reward’ for hard work put in during the year. Several students commented that both meeting other students studying the same module and having the opportunity to put theory they had learned into practise would help them stay motivated. We were impressed by the willingness of all the students to engage enthusiastically in both the ecology and geology activities, irrespective of which area interested them most. Poor John had a hard act to follow after we saw dolphins and a seal just offshore whilst doing quadrats and a pregnant skink tried to nest inside my rucksack! However students found the geology fascinating too and enjoyed being able to ‘walk back through time’ along the foreshore at Howick. Some commented that they had found it very useful to be exposed to a wider range of field techniques than ecology or geology alone would have provided. Others liked the fact that we made links between the lichens and plants found and the underlying geology, as one environmental factor affecting their distribution. So, where to go from here? There is a clear appetite for practical experience amongst the students who came on our trip, with people coming from as far afield as Belgium, Germany and Switzerland for the weekend, but only a small proportion of the students currently studying S104 signed up; we had the pleasure of a self-selected group of enthusiasts. They are keen for more, similar experiences and asked if we would organise a trip to Iceland for them – we’ll have to see what Indus Experiences can offer on that front! Some of the group may even come to India with us next summer. What of those students whose interests are more with the lab based sciences? Are there any former residential school tutors out there who have access to facilities they could use to give other groups of S104 students some practical experience? Or, better still, will the OU re-introduce residential schools when they re-jig the first year science curriculum? This entry was posted in Uncategorized and tagged Alnwick, ecology, geology, Howick Bay, Open University, Quadrat, residential school, S104, SXR103. Bookmark the permalink.